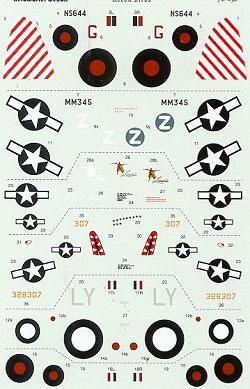 This sheet offers a number of different aircraft on it, all of them in rather interesting camouflage schemes. The first two are Mosquito PR.XVI in overall PRU blue. You can see that they both have D-Day stripes on them. THe upper plane is from 680 Squadron in Italy. The stripes on this aircraft are only on the fuselage. Though the red and white tail stripes are provided as a decal, it would be a good idea to paint the fin white. The other is from 653rd BS in England. The stripes on this are only on the lower fuselage. You can also see where the British roundels have been painted out. Kits for the Mossie are listed as from Airfix and Matchbox. You can add to that Hasegawa and Tamiya. For the proper engines and canopies, Paragon makes these should you need them for your kit. Next are a pair of F-5Es. Revell and Hasegawa are listed as the suggested kits. Perhaps the Dragon P-38 would be a plausible choice as well. Paragon does a proper nose conversion for this variant. The upper aircraft is from the 7th PRG in the UK and like its brethern, is in synthetic haze paint. It only carries D-Day stripes on the lower booms. The 10th PRG F-5E has these stripes on the wings as well, but only on the bottom. Sort of makes the special paint a bit useless! Finally, two Spitfires. The upper aircraft is a PR.I of the PDU in 1940. It is an overall extremely light pink. Actually is it said to be white tinged with pink. The other is a PR.IV of 1 PRU in 1942. This aircraft is in overall PRU blue and like the previous Spit is unarmed. It is converted from a Mk.V. Suggested kits are Airfix and Hasegawa, though you can add Tamiya to that mix as well. You'll also need the special PR canopies for these planes. They should be available from some of the British aftermarket folks. 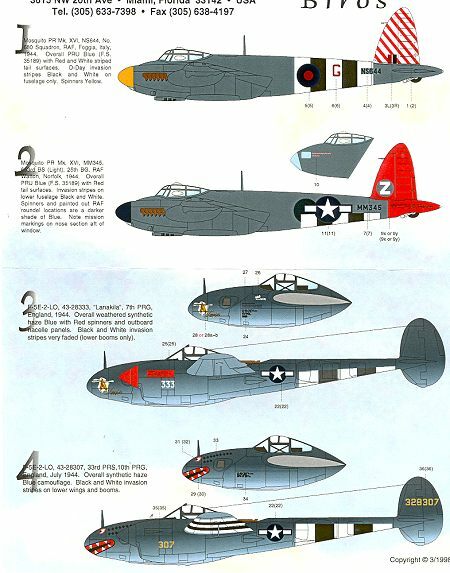 Frankly, a pretty neat sheet that covers some of the more unusual aircraft. None can be built straight from any kits that I know of so you'll have to utilize a bit of searching and some of that modeling skill to do these planes.